BRITTANY HOFMANN | THE SPECTRUM Tyson Ward (23) picked up his second double-double of the season. Surrendering 11 3-pointers, the North Dakota State men’s basketball team fell to South Dakota State this past Thursday by a score of 87-69. The Jackrabbits raced out of the gates to an early 13-point advantage while the Bison were stone cold from the field. Triples from Rocky Kreuser and Cam Hunter drew NDSU within 10, but the Bison failed to capitalize on opportunities to draw closer. The Bison managed to generate defensive stops and turnovers, but it wasn’t long before one of the nation’s best offensive teams to hit their stride. While NDSU shot 4-of-11 from beyond the arc, the Jacks shot 64 percent from range in the first half. Mike Daum and David Jenkins Jr. led the scoring barrage for SDSU, combining for 29 first half points. The Jackrabbits entered the locker room with a 19-point lead, a high-water mark for the first half. The Bison traded punches with SDSU in the second half, but failed to draw near their rivals. The Jackrabbits kept the Bison at bay, pushing their lead to as many as 25 points. NDSU was unable to get out of their own way, turning the ball over 18 times. It was an uncharacteristically sloppy performance for the Bison, who turn the ball over at the third lowest rate in the conference. The matchup underscored the road struggles that have plagued the Bison this season. The Scheels Center has been the site of home cooking for the Bison. NDSU has shot 50 percent from the field at home, while they’ve held opponents to 41 percent shooting. The reverse is true on the road. Heading into the clash with the Jackrabbits, road opponents had held the Bison to 39 percent shooting while the hosts shot 53 percent. Those poor figures continued Thursday. The sharpshooting Jackrabbits nailed 54 percent of their attempts, and NDSU only managed to shoot 41 percent. SDSU is one of the country’s top scoring teams, ranking in the top five in field goal percentage and 3-point percentage. The shooting splits have culminated in eight straight road losses for the Bison, whose road woes date back to the previous season. NDSU was 5-10 away from home in 2017-18. Daum, the reigning Summit League Player of the Year, was his usual unstoppable self against the Bison. The senior notched his third straight game with 30-plus points while also grabbing 17 rebounds, leading all players in both categories. Junior guard Tyson Ward picked up his second double-double of the season in the defeat, tallying 18 points and 12 rebounds. Hunter and Deng Geu joined him in double-digits, scoring 11 and 12 points, respectively. Quizzically, Geu only saw 19 minutes on the hardwood. The junior has been one of the Summit League’s most efficient scorers. Geu ranks fifth in the conference in points per 40 minutes with 23.7. Geu has yet to play more than 28 minutes in a game this season and has yet to start. The Bison finally broke through with their first road win Saturday in Tulsa, Oklahoma. Off the strength of Vinnie Shahid’s 23 points, NDSU took down Oral Roberts by a score of 67-57. NDSU and the Golden Eagles clawed at each other throughout the contest. 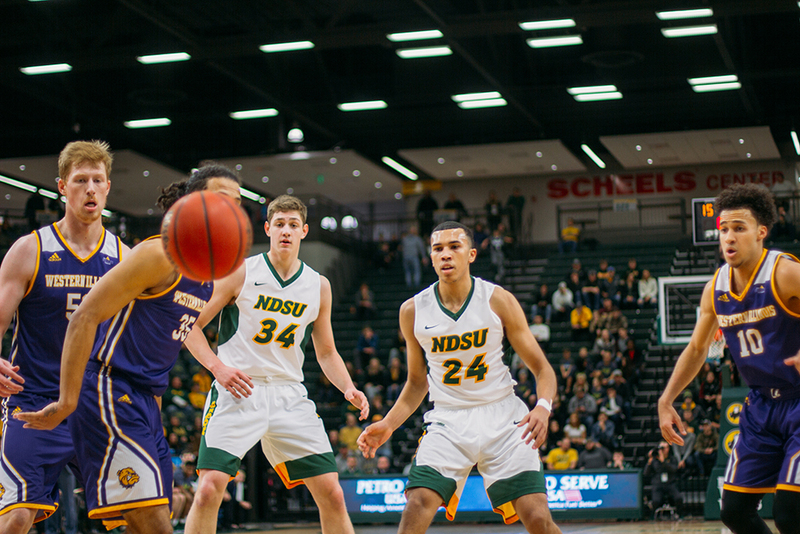 The Bison held a narrow three-point advantage at the end of the first half, setting the stage for a contentious second frame. The score teetered back and forth throughout the second half, but the Bison seized control late with Shahid and Kreuser leading the charge. The duo combined for 17 of NDSU’s 23 points in the final 8:42 of the contest. Shahid knocked down six 3-pointers on the night, a career high. Hunter provided the highlight moment in the closing seconds, throwing down a dunk through contact from Kevin Obanor. In his four games back from injury, the Olathe, Kansas product has been a key cog off the bench. The Bison were fortunate not to squander their opportunity at victory. NDSU missed 10 free throws on the night and shot merely 37 percent from the field. Fortunately, ORU shot at a similar rate. With the win, the Bison improved to 10-12 overall and 4-4 in conference. The victory pushed the Bison to fourth in the Summit League, trailing the leading Jackrabbits by three games. NDSU will be in action next 7 p.m. Saturday, Feb. 2 when they attempt to do the double over Western Illinois. They’ll go for the same feat the following Wednesday against North Dakota.